The purpose of a customer survey is to understand how customers perceive the organisation and inform improvements in a way that lifts the overall performance of the organisation. So, you must include questions that will help you meet that goal. These are questions that link the customer’s feedback to the success of the organisation. 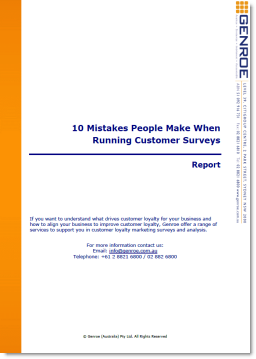 Put another way, customer survey outcome questions measure something that is important for organisational success. These questions attempt to understand how the customer feels or perceives different elements of your products and services. This information is key as it will be used to determine which attributes are the most important and poorest performing. Thus, which need to be improved with the most urgency. Focusing on improving those high importance/poor performing elements is the key to improving organisational success. Knowing that improving a specific attribute is part of the answer but the other part is knowing how to improve that attribute. “How” questions provide the insight required to make positive changes in the business. So, the outcome question must measure one of these. While there are many questions that might be used, there are three that are most common and have demonstrated links to the drivers of value. Net Promoter Score® (NPS®) a common and useful customer survey question that has been proven to link to customer retention and cross-sell/up-sell in a variety of industries. This question can be used in a variety of business situations: Business to Business, Business to Consumer, Government to Citizen, Relationship and Transactional surveys. Because of its strong customer service nature, this question works best in transactional customer service situations. Customer Satisfaction (CSAT) is one of the first outcome questions used by companies but it does not strongly correlate to any of the business outcomes noted above. For this reason it is falling out of favour as a customer survey question. Attribute questions should be easy for the respondent to understand and contain a single idea or theme. The best approach is to use what is called “Construct Specific Response” options. This simply means the responses are specific to the question. This second form of the question is called an Agree/Disagree response option. While it is easier to just create a series of statements and ask the respondent to Agree/Disagree, this approach is less accurate. A bipolar scale one that has an extreme at either end with a neutral response in the middle, e.g. very unhappy to very happy. How do you rate the technical competence of our operational staff? Please rate the access to training courses and workshops we provide. How responsive are we in returning your call or email? The most common and useful “How” question is the open ended or text response question and they don’t have to be complex to be very useful. Do you have any comments on our business approach? How could we improve our technical support?